Ed Del Grande is a three-time Master Plumber, GBCI LEED green associate, and contractor. He was born and raised in a family-owned plumbing business, and has over 30-plus years of experience in every aspect of construction. He holds three current Master licenses in pipefitting, fire protection, and plumbing, and is also a licensed private pilot and a licensed Coast Guard OUPV Charter Boat Captain. Ed spent his days working as a self-employed contractor and working nights as a professional comedian from 1981–1991. He worked his way up the comedy ladder and was voted one of the funniest comedians in America by Showtime TV; he also appeared on ABC TV’s America’s Funniest People. Then, in 1992, Ed retired from comedy to combine his performing and construction talents and became one of the early pioneers in home-improvement television. Starting on HGTV with shows such as Dream Builders and The Fix, Ed later went on to help build the DIY Network and HGTVpro.com with shows such as Warehouse Warriors and Ed The Plumber. Today, Ed has grown to become one of the most respected and experienced how-to personalities in the media business. Along with his television and video work, Ed writes a weekly nationally-syndicated newspaper column for the Tribune News Service, and also wrote his first book, Ed Del Grande’s House Call, published by the Penguin/Viking Studio Group. 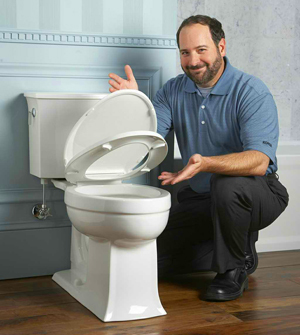 Ed speaks at live events and trade shows across the country and is currently the “how-to expert/spokesperson” for the Kohler and Sterling companies. Ed has also done work for the Autodesk, Amtrol, Porta-cable, and Thoroseal companies. Ed has proven himself to be one of the most entertaining and informative home improvement guests for radio and TV talk shows and news broadcasts, with appearances on Ellen, The Martha Stewart Show, NBC’s The Today Show and The Tonight Show, MSNBC News, Fox Business News, and was a regular contributor on CNN’s Open House show, to name a few. He also has been written up in major newspapers and magazines, such as the New York Times, the Chicago Sun Times, the San Francisco Chronicle, the Boston Herald, Money Magazine, TV Guide, and Consumer Reports “Shop Smart” Magazine, where one of Ed’s videos was chosen as among the best Fix-It-Yourself tutorials on the internet. Click here to see the video.